How do you see the future of the Cannabis Industry? Spiritual History tells us in the land of the First Nation (now known as the United States of America) people lived in harmony with nature. First stop: Meet up with Co-Owner, Danny Marks and Shea Evans, my guide to the facility and patient advisor. First impressions are a lot, and they radiate a welcome and openness coupled with a confident professionalism that will dispel any preconceptions one may have. Q. (NB) What took so long from date you began to now, delays?? Who is the other owners of MOCA? Q. (NB) Is the product all coming from Illinois or out of state too? A. (Danny Marks) All product will be grown in Illinois. There are about 7 active cultivators at this time. Tall and stunning is the presentation case from MADE. Which has a store at 1430 W. Chicago. www.madegallerychicago.com @madegallery FB, IG. This is a highlight with all the artistry in a glass display case. An array of fine glass objects utilitarian and also beautiful art pieces on their own. Yes, lots of glass, paraphernalia on display and for sale, some which you may need instructions for use, which is readily available. Artisans created pieces certainly will allow for conversations and enjoyment. They have many pipes and other items, from small to bigger and elegant up to fine art pieces. The “guide” will gladly demonstrate and explain how to pick something to suit. Historically, Marijuana is an American tradition with a jagged past and evolving future. Over hundreds of years, Cannabis, and even the Hemp plant (non-THC variety -which is used in industry for rope, clothes, food, etc., ) has gone through rebounding stages of legal, illegal, medicinal use, recreational, including full circle legal – depending on your state. The Federal Government has bowed to individual State’s Rights and The majority of Americans, about 58% or higher, think pot should be legal. Period. According to Newsweek, (9) Bernie Sanders (Progressive/ Socialist, Democratic Candidate for President) said “I suspect I would vote yes” to a measure to legalize recreational marijuana “That averaging 58% of Americans – state it should be legal. Period.
. Mandatory sentencing and increased punishment were enacted when the United States Congress passed the Boggs Act of 1952 and the Narcotics Control Act of 1956. 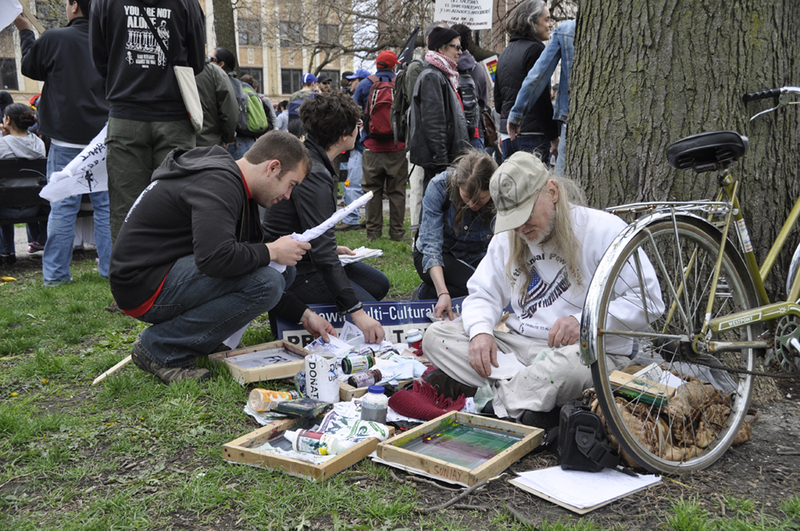 Counter culture has gone mainstream with the social, economic, and health benefits increasingly known. Since the Marijuana Legalization 2016: Illinois Posts Over $1M In Legal Medical Sales . 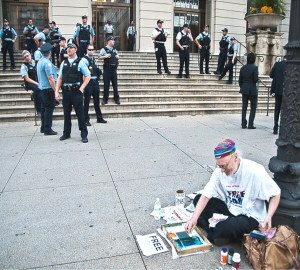 This may be one way to balance the Illinois Budget Crisis. The law state by state continues to evolve in favor of lifting the ban on “Prohibition”. Does this sound familiar? Remember – after all, it happened before, with Alcohol. The author of this article, “Life, Liberty and the Pursuit of Happiness & Cannabis: & Opening of MOCA| Modern Cannabis in Chicago” ©2016 Nancy Bechtol, APA photojournalist, Assoc. 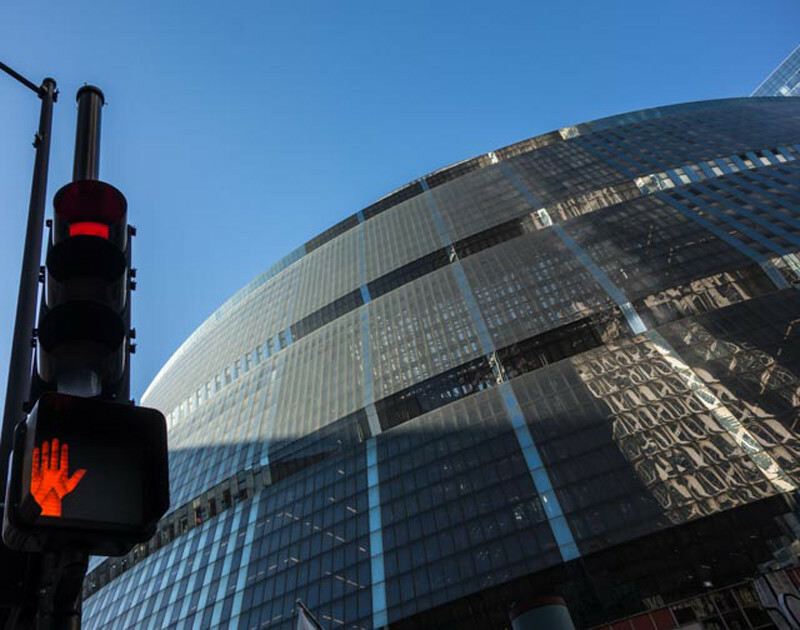 Bureau Chief -Chicago, www.americanpressassociation.com acknowledges and relied on vast reference of a universal knowledge base, in addition to the cited sources, and decades of information out there ranging from traditional sources to alternative publications. In global thanks for all the input. Especially thanks to MOCA|Modern Cannabis, (a Medical Marijuana Dispensary) the owners, especially Co-Owner, Danny Marks, and staff/vendors who took time for interviews, as listed in the article. Most importantly is their dedication to those in need, who now who can benefit and live their lives more fully without fear. 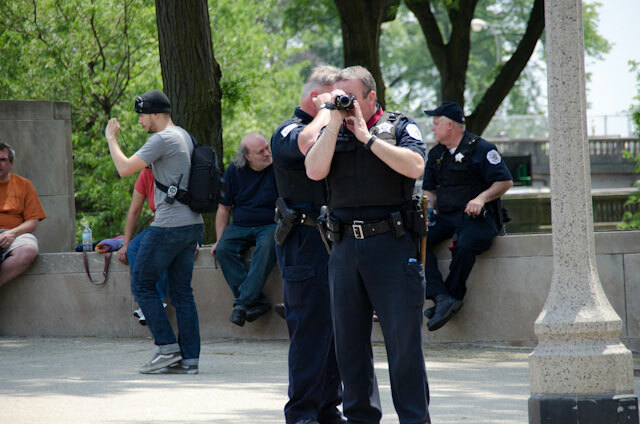 Illinois now in “Code Black”: An emergency situation involving personal threats to safety of one or more persons in a public place, including assaults, confrontations, hostage situations and threats of personal injury or attack on Art or Culture of a People. On 10. 14. 15 I am standing outside the now shuttered Illinois State Museum of Chicago in The State of Illinois Building, the Thompson Center and reflecting on the many times I had visited and even had the opportunity to show my work in several exhibits and screenings, alongside other Illinois Artists. 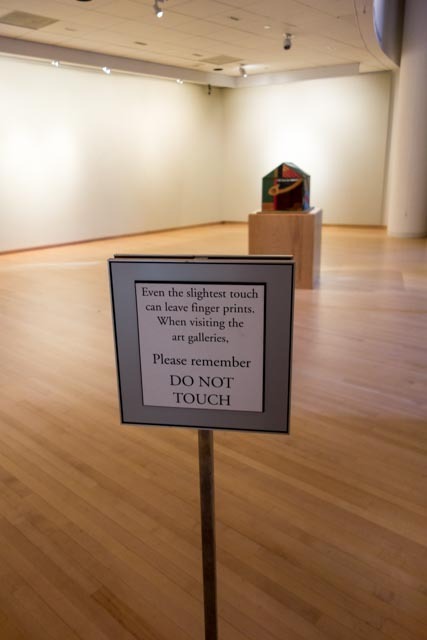 A great number of artists were encouraged by this venue, as well as visitors including school groups engaged this resource with visits, panels, and artist talks. I thought of Jane Stevens, a long-time curator of ISM groundbreaking shows, too many to mention, but the likes of “Electronic Immersions” with groundbreaking visionaries like legendary Dan Sandin, IP (Image Processor Creator-who brought it to share with iconic Phil Morton (mentor) giving rise to artist/students at SAIC -founder of Video Dept). There are so many artists and shows that would never have had a voice. 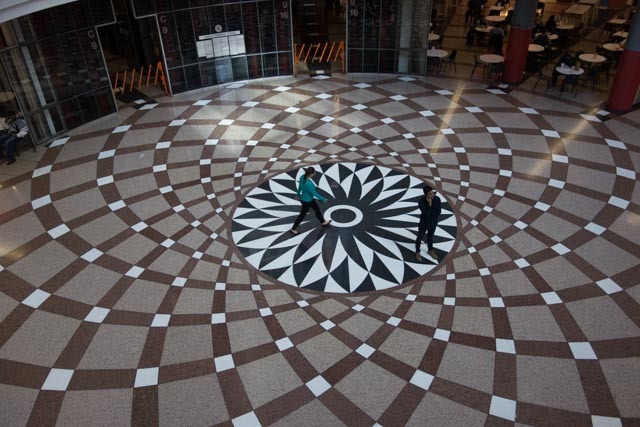 Jane’s visionary curatorials with the American Indian Center Community has, for years, been intensely important. 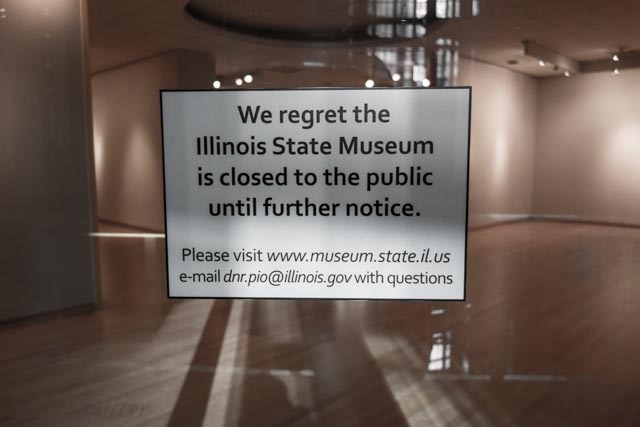 This includes shows which originated at the ISM-Chicago and traveled to linked museums, including Lockport, and the Illinois State Museum in Springfield. Jane is currently a Scholar at the Newberry Library and active in several projects for arts, history and culture. I cannot help but find myself reflecting on the state of art and culture in Illinois. What worth is given to it in Illinois? Evidently very little by the current administration, as I hear Gov. 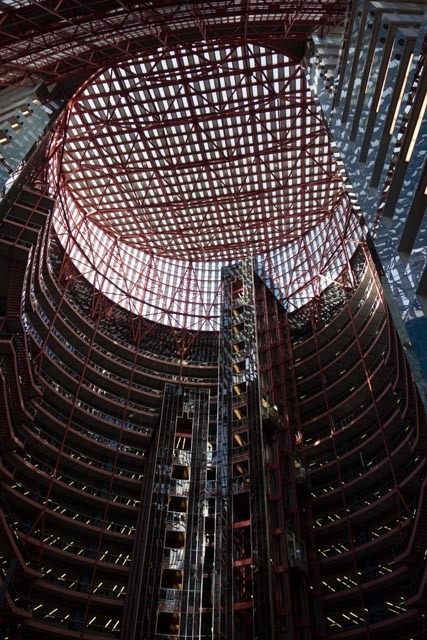 Rauner thinks this Helmut Jahn building is a “tear down”. Think of history. When all else is gone, the culture/art of a people tells the story for lifetimes. 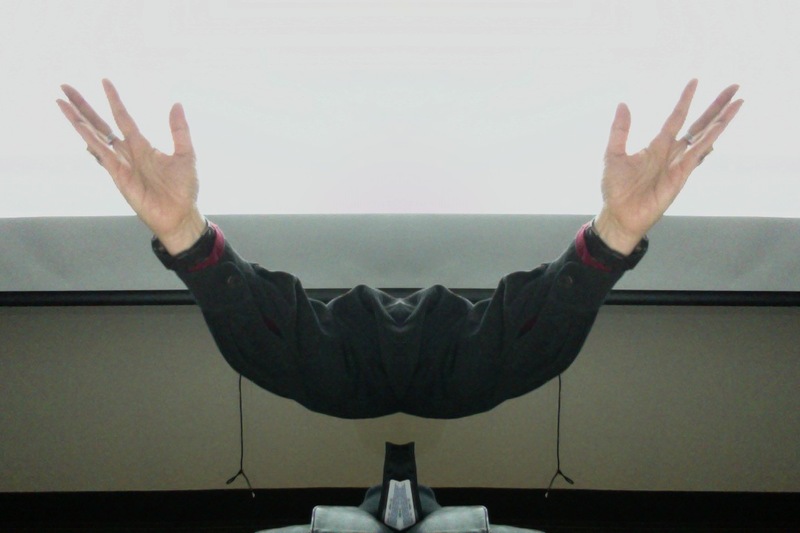 October 13, 2015 12:45 pm | Updated: 12:51 pm, Tue Oct 13, 2015. CHICAGO (AP) — Illinois Gov. 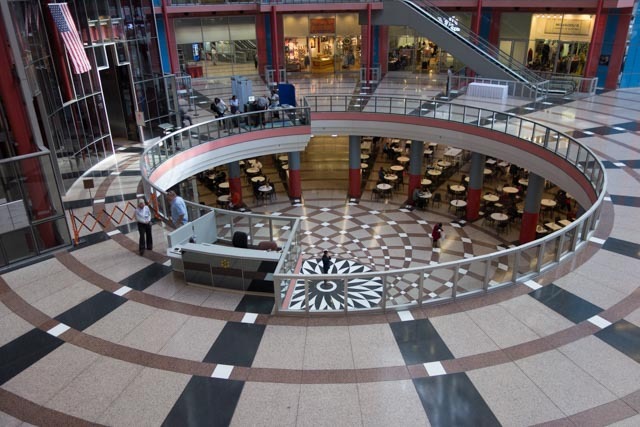 Bruce Rauner wants to hold a public auction to sell the James R. Thompson Center, which houses state government offices in downtown Chicago. 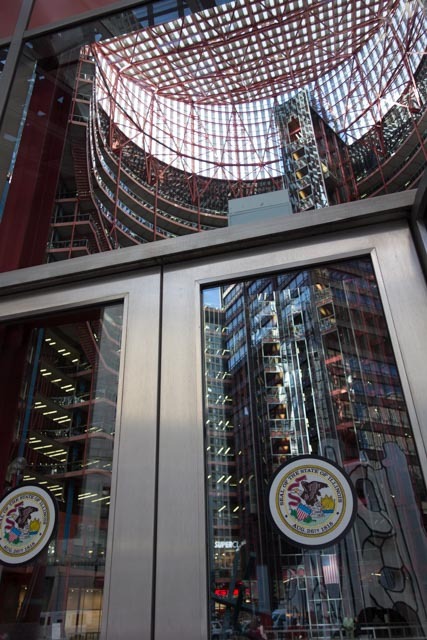 Rauner made the announcement Tuesday in the 16-story glass-paneled building’s large atrium, calling the building “ineffective” and a “very wasteful, very inefficient use of space.” He said selling the building and moving state workers elsewhere could save the state between $6 million and $12 million annually. He called it a “good move” for taxpayers. The stunning building also gave rise to suicides, and as I look up I imagine the leap to the target tiles 15 floors down. 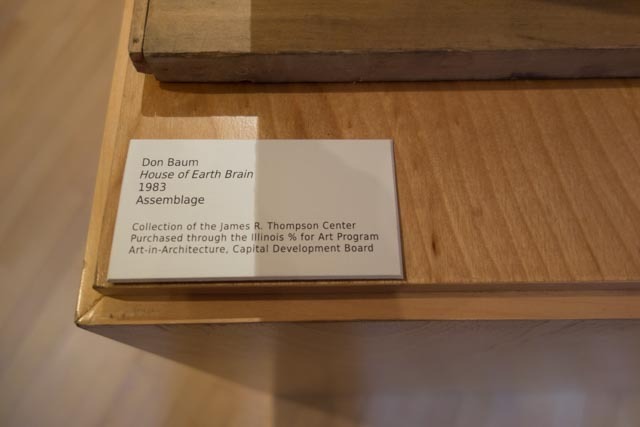 These actions to shut the Illinois State Museums and destroy the Thompson Center is like State Suicide. Life in Illinois is in the balance. only issue– he passed on 2 years ago. Do you believe in the power of the spirit beyond physical death? 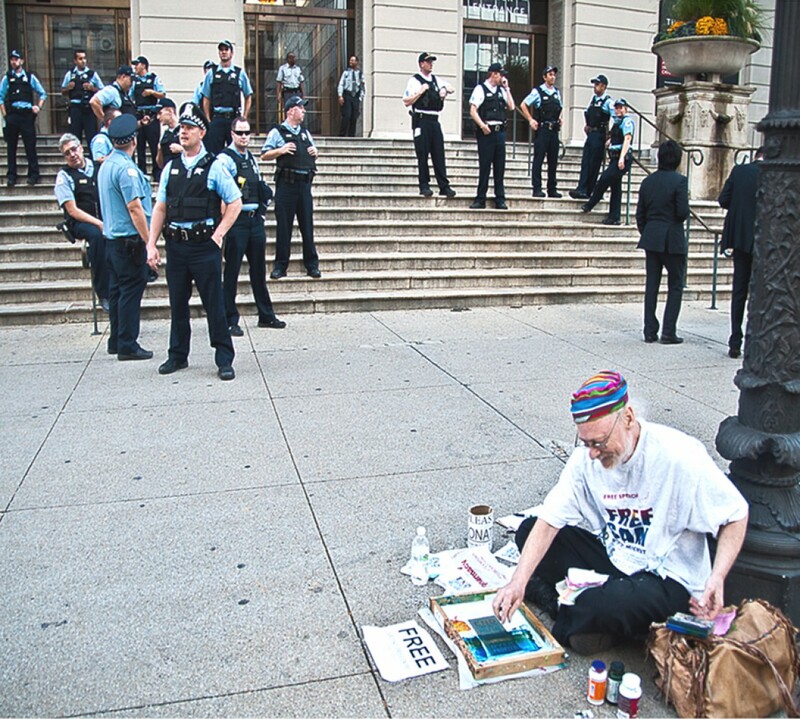 Chris, artist and defender of the First Amendment, gave his life and dedicated his energies to overturn the Peddler’s Licence. But this challenge unbelievably ended up facing a Class One Felony Eavesdropping charges with 4-15 years in prison.-(in 2008 for audio recording his own arrest!) if convicted but he won with 2 probono attorneys Weinberg and Kutnick! THIS is a true story. 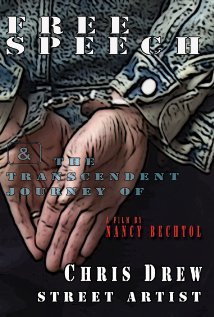 Rooted in Chicago – my indie film, “Free Speech & the Transcendent Journey of Chris Drew, Street Artist” (99 min) with the soundtrack of “Paper Airplane” by Alton & Mansfield courtesy of Hey Now Records. has very deep/grassroots connections which transcends boundaries! My goal is to establish Uptown Multi-Cultural Art Center as an institution with a paid staff and then go on to establish my own career and web site online. Along side of this I wish to work at long term part-time jobs in the creative and/or non-profit industries to further these aims. My creative, office and management skills make me a valuable and cost effective employee to any small or large business. Specialties:proposal writing, office management, HTML coding, computer troubleshooting, repair and management, Photoshop, GIMP, Web site development, web site management, photography, screen-printing, layout, design, public relations, press release writing, radio spot writing, office software, letter writing. 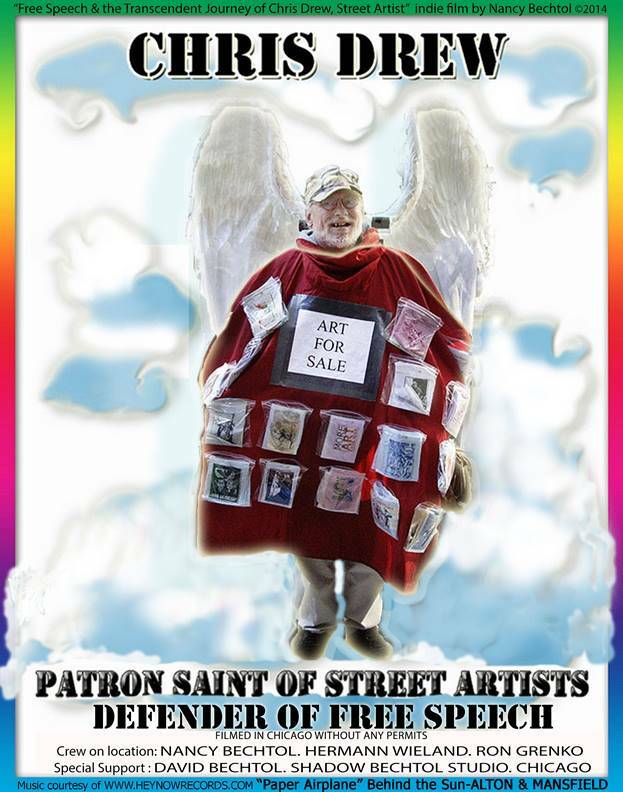 Founder and continuous manager of this community arts organization accomplishing over 20 years of steady arts programming with an all volunteer force. Imagine what we could do with a paid staff! Taught computer literacy and basic office applications to beginning and intermediate students. 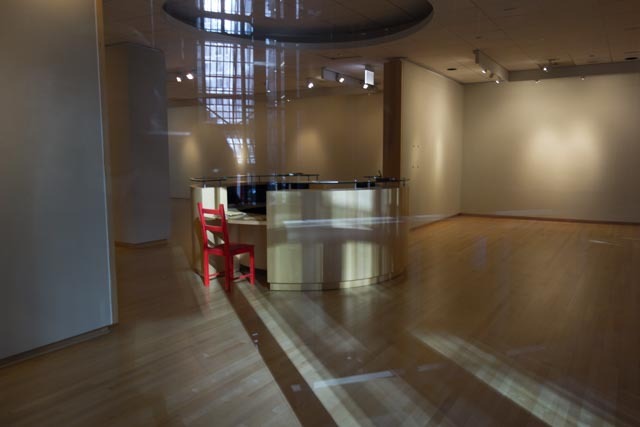 DIGITAL MINDSET BLOWS MINDS AT THE 4ART INC GALLERY (4TH FL) IN ZHOU B ART CNTR – now..
“Zombie”Illinois Eavesdropping Law and Sleeping Cop? 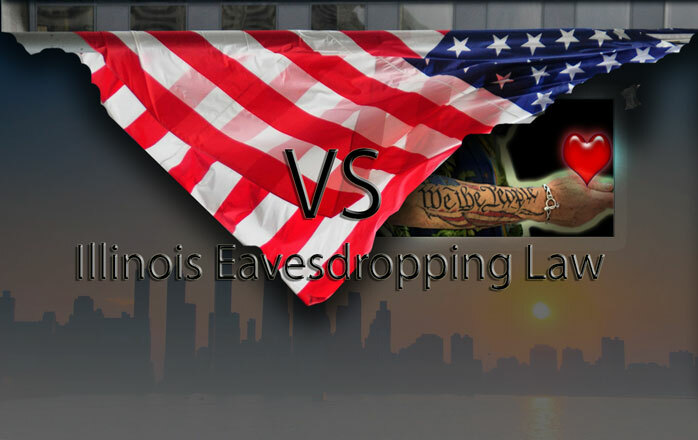 This NEW resurrected “Zombie” Illinois Eavesdropping Law (which came back to unholy life Dec 2014) claims at least one victim–for now, more to follow… Remember we thought we won this forever, when the Illinois Supreme Court declared the Law Unconstitutional in March 2014? 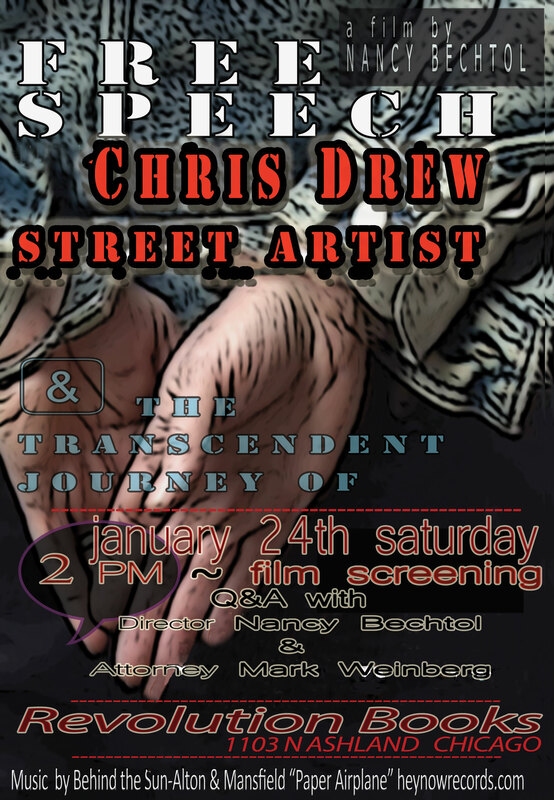 as shown first hand in (“Free Speech & the Transcendent Journey of Chris Drew, Street Artist” feature documentary by Nancy Bechtol premiered 2014)https://youtu.be/2ncu2AjO5ok Remember Chris and all the freedom fighters for the First Amendment —now……watch out.. it is not over.. now the “interpretation” of the law and repercussions begin..in Illinois which has been plagued with injustice – count the ways..
OTL #433: Who is.. Listening? : WGN 720 AM -New Illinois Eavesdropping Law and more..
Mike Stephen meets up with Chic-a-Go-Go host Miss Mia Park in honor of the taping the 1000th episode of her wildly successful CAN-TV dance show, talks with local filmmaker Nancy Bechtol about the new Illinois eavesdropping law and her documentary Free Speech &the Transcendent Journey of Chris Drew, Street Artist, and checks in with Aldertrack co-creator Mike Fourcher about how the Chicago aldermanic races are shaping up. 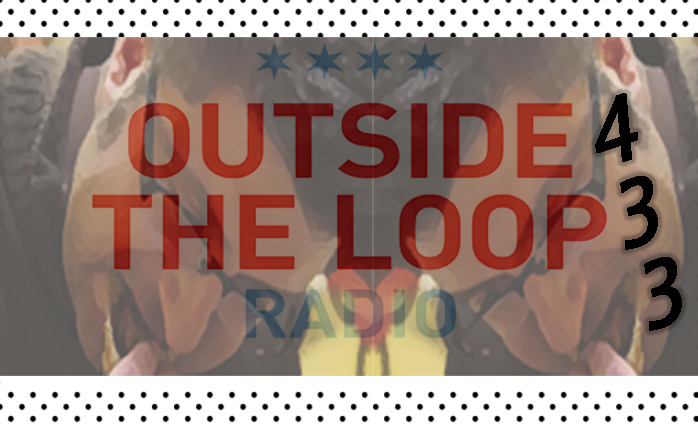 This week’s local music is provided by Minor Characters.